Chikubu (竹生島, Chikubu-shima) is a small island located in the northern part of Biwa Lake of Japan. It is a nationally designated Place of Scenic Beauty and Historic Site. The coastline of island measures 2 km. It is the second largest island in Lake Biwa, after Oki island (Oki-shima, an inhabited island). The island is part of Hazayaki-cho, in Nagahama city of Shiga Prefecture. The island is also called the Island of the Gods and designated as one of the Eight Views of Lake Biwa. Several works of the Japanese performing arts relate to Chikubu. They include the Noh play Chikubushima and the Heike Biwa work Chikubushima Mōde, two koto melodies named Chikubushima, a jōruri (itchūbushi), a nagauta, and a tokiwazu-bushi of the same name. There are various places of interest on the island. In the southern part is the Tsukubusuma Shrine, said to have been established in 420, and Hōgon-ji, a Shingon temple said to date from 724. Formerly known as Chikubu Benzai-ten, it ranks with the Enoshima Shrine in the Kantō region and the Itsukushima Shrine in the Chūgoku Region as one of Japan's Three Great Benzaiten Shrines. Many structures were brought to the island by Toyotomi Hideyori, son of general Toyotomi Hideyoshi. Kannon Hall and the Karamon-style gate were brought here from the gravesite (Toyokuni-byo; now Toyokuni Shrine) of Toyotomi Hideyoshi. They originally stood in the Higashiyama ward of Kyoto, and are regarded as fine examples of architecture from the Azuchi-Momoyama period. Moreover, the Karamon gate is a National Treasure of Japan. During the Sengoku period, retainers of Azai Nagamasa confined his father Hisamasa to Chikubu Island, forcing him into retirement and establishing Nagamasa as his successor. ^ "【Kohoku Area Course】Relaxed & Laidback, The Soothing Power of Nature & A Trip Back in Time". Biwako Visitors Bureau. Retrieved April 1, 2019. ^ "Chikubu Island (Chikubushima)". Go Biwako. Retrieved March 12, 2014. 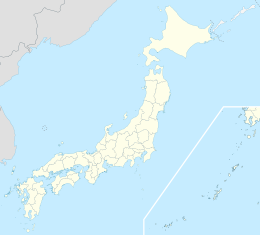 Large part of the article incorporates material translated from 竹生島 (Chikubu-shima) in the Japanese Wikipedia, retrieved on November 21, 2008. Watsky, Andrew Mark (2004). Chikubushima: Deploying the Sacred Arts in Momoyama Japan. University of Washington Press. ISBN 978-0-295-98327-1. Wikimedia Commons has media related to Chikubu Island.